See our Eclipses page for information about the meanings of Eclipses–both lunar and solar–in our lives, as well as information surrounding the most current eclipses. 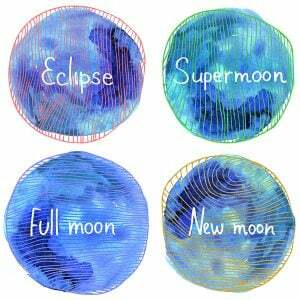 What follows is a list of all New Moon and Full Moon events, including those that are Solar and Lunar Eclipses — their dates and the zodiacal degree and sign they occupy — for 2010 to 2030. Dates and Times are GMT or UT. Please note that if you are in a different time zone, the dates may change along with the times on certain dates. Example: subtract 5 hours for Eastern Time from the dates below. See below the table (further down on the page) for a list of Lunations and Eclipses from 1900 to 2050. See the Meaning of the Eclipses.